A family owned and operated business, American Dream Heating and Cooling started in 2011, bringing exceptional comfort to homes in the Central New Jersey area. From our shop in Parlin, our owner Artur and the rest of the American Dream team work hard to provide the best air conditioning and heating equipment, services and prices in the region. We’re an independent Trane Comfort Specialist™ dealer who offers the top products in the industry and our knowledgeable, NATE-certified technicians provide you with the attention to detail and customer service that can create a whole new level of comfort. For high-performance, cost-effective products and services that bring lasting benefits to you and your family, call the Central New Jersey comfort pros at American Dream. 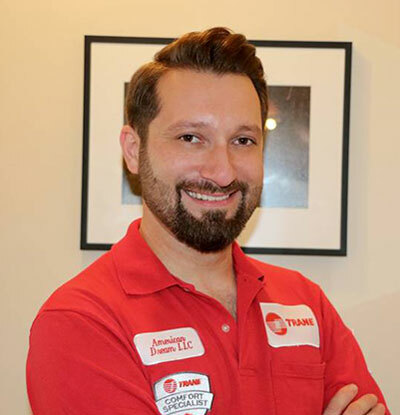 At American Dream Heating and Cooling, owner Artur Agadzhanyan leads the way, bringing a hands-on approach to serving his customers and offering the most efficient, high-tech heating and air conditioning products available. Artur’s many years of A/C industry experience and focus on giving customers the best equipment at prices that fit their budgets has fueled our growth as one of Central New Jersey’s leading heating and cooling companies.